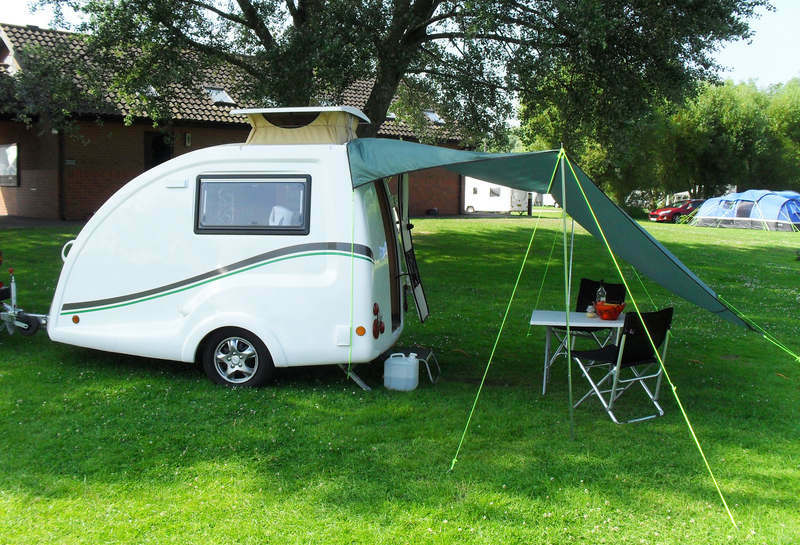 Go-Pods represent a perfect compromise between the fun of camping & the comfort of caravanning. Small, go anywhere Go-Pods bring additional freedom by allowing you to find those off the beaten track sites, that are inaccessible to regular caravans. And Go-Pods are incredibly light, meaning that they can easily be towed by today's super-minis, making them a viable option for people with smaller cars too. Go-Pod in comparison with a regular caravan. Being just a little over 4m long & very streamlined means your Go-Pod tows effortlessy and you'll often forget it's even there! Plus if storage is an issue, Go-Pods fit in the smallest gardens and even many garages. Leave a few essentials packed inside your Go-Pod and be ready to escape at a moments notice. 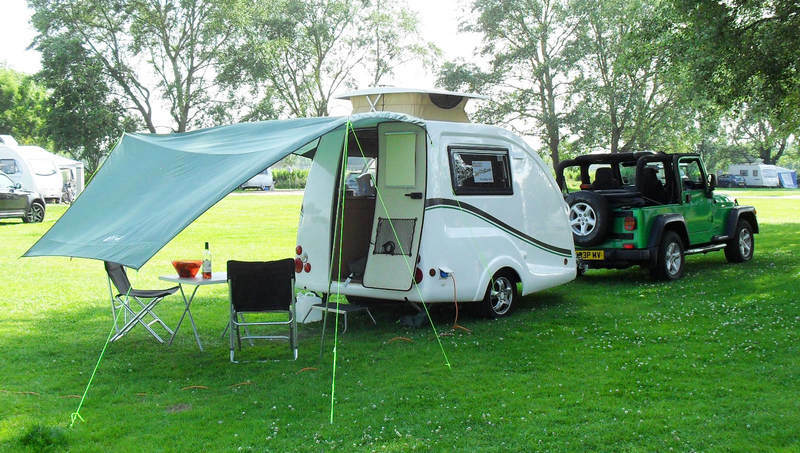 Hitch up in seconds and go - ideal for the changeable British summer! In fact Go-Pods are so easy to hitch up & tow that they're even suitable to use as a day base at outdoor events like a day at the races. If more living space is required, the quick assembly Khyam awning provides a convenient solution and is available as an optional extra. You'll find you will be using your Go-Pod far more than you thought & certainly more than a conventional van or tent! And if you're considering a teardrop caravan as an option, with the kitchen at the rear... wouldn't it be nice to make your morning coffee without having to go outside? • Motorhomes - lovely but expensive! With purchase prices of around six or eight times more than a Go-Pod, even their first year's devaluation will cost you more than a brand new piece of a Pod! And apart from the limitations of having to drive around in a lorry-size vehicle, they can be prohibitive once you're there too, as you'll be less inclined to want to break up camp to head out for a drive. Which is why many motorhome owners have to tow a small car behind - adding a further vehicle to the running costs. Go-Pods allow you the freedom to use your normal vehicle for excursions and for grabbing supplies. More than half of our customers are down-sizing from motorhomes in favour of the convenience of a Go-Pod. • Camper Vans - very cool looking and some are even iconic. But these too suffer from many of the motorhome's limitations. They are pricey and of course you don't have a runaround vehicle at your disposal when on site. What's more, unless they become your everyday vehicle, (which isn't always very practical), then they bring the inevitable burden of extra vehicle running costs. Go-Pods however can usually be used with your existing vehicle & when they're not in use, they're not costing you anything! Making very good economic sense. Add to this that Go-Pods hold their value very well and it all adds up to a great deal. • Caravans - roomy compared to a micro tourer but this feature can become offset by the drawbacks of owning a larger caravan. Storage, (the cost & convenience of it), is probably the first thing to consider as not everyone is lucky enough to have storage at home. If you don't have to pay storage fees you might likely store your caravan in the front garden which although convenient, isn't great for your security - as everyone knows when you are away from home. Go-Pods being small are far more inconspicuous, especially when stored under the custom made winter cover. Many people even store them in their garages and have them their, ready to go. And unlike a bigger caravan, you'll find there's less planning with a Go-Pod trip. They really are so easy to hitch, tow and set up that even an overnight getaway is a completely viable, welcome escape. And en-route, being stuck in an awkward situation with a Go-Pod is very unlikely. Even in a tight spot, you can just unhitch, spin it around, hitch back up and you're on your way again. Many consider Go-Pods to be more fun than conventional caravans, as although they still have all the comforts of full size caravans, their compact nature and quirkiness will really do make you smile. Go-Pods hold their value better than regular caravans and can be purchased new at a fraction of the cost. 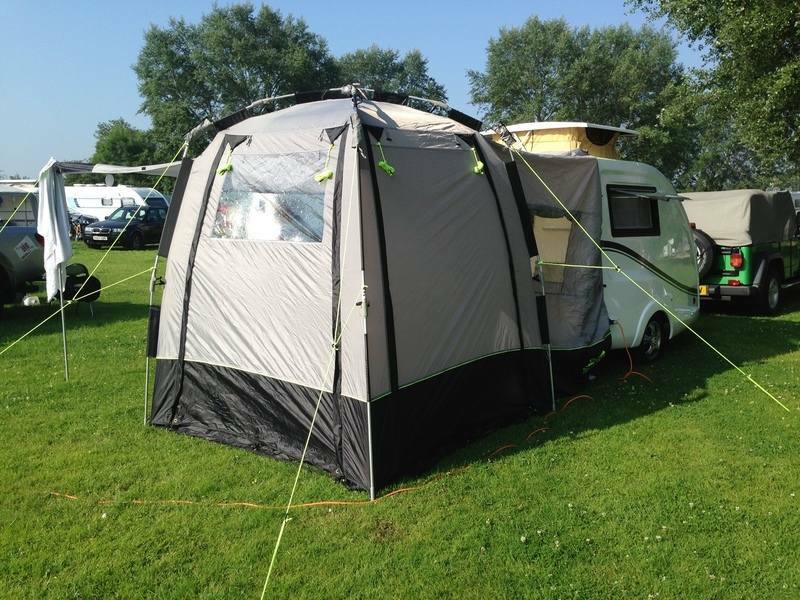 • Trailer Tents - roomy and easier to store than a caravan but also with some inherent drawbacks. Setting up can take some time, (even longer in windy weather), especially compared to a Go-Pod. In it's simplest form, the Go-Pod only requires you to wind down two legs and start relaxing. Other trailer tent fun-busters include needing to ensure your tent is dry before packing away and if it rains on the day you're going home, this will mean opening it out to dry when you get home. With Go-Pods you just lower the clever pop-top and go! Of course tents are too cold for most people to use in the winter but Go-Pods are fully insulated with thermal retentive styrofoam within the walls, allowing all weather use of your micro tourer, so the fun continues all year. • Tents - cheap to purchase for summer use and good value for sure but not the most comfortable at times, with airbeds that tend to deflate in the night! Plus when it rains, a tent is a pretty miserable place to be. Go-Pods allow you to sit inside a cosy environment, on your memory foam furnishings when the weather takes a turn. Just put your feet up, make a nice hot drink and watch your favourite film on the flatscreen TV/DVD. No need to worry about packing away in the wet or having to go home early just in case of rain either, as in your Go-Pod you can happily weather the storm! • Hotels - Not as cheap as they were and of course, you never quite know what you're going to get. And the nightly room rate isn't the only thing you'll save in your Go-Pod as you also have the option of taking your own food, further saving on those holiday expenses. Hotel costs are 'lost money' and so it makes good sense to spend your money on something that has a lasting, intrinsic value instead. You have you're own personal space in a Go-Pod & private bedding. And by leaving your 'Pod packed on stand by, it becomes like a suitcase that's ready to pick up and go, increasing your spontaneity for getting away. • Summary - The Go-Pod no doubt ticks a lot of the boxes and offers many advantages over the alternatives listed above. It's excellent build quality, durability, styling & superb value, has made it the leading model in it's class. Even if you don't like towing, this ultra light trailer will not phase you in the slightest. It has its own braking system that improves control, is very aerodynamic & tows like a dream. Of course to retain true micro tourer dimensions and benefits, a separate bathroom area is sacrificed but then most campsites have great facilities and many of those with on-board facilities actually prefer the shower block over the risk of damp, using their water supply up and having to empty the grey water after. So if anything is to be compromised, the bathroom area is a very good trade off. The seamless, one piece monocoque design eliminates many of the water ingress problems that plague other camping options, making the Go-Pod very durable. Further considering the new price and re-sale values, you may agree that this is the least expensive option, best value option on the market today. Tracey from Birmingham collected her new Go-Pod at the weekend after taking advantage of a cancelled order. Here's what she had to say: "M & T B collected their Pod & hitched to a Jimny. It tows as excellently as the company said it would & looks great with the Jimny. The you tube clip sold it to us looking forward to using it. Excellent value & just about to join the Go-Pods Owners Club!" Jeff & Karen from St Neots Say "Just to let you know that we are now officially the proud owners of "Biggles" who is now sitting on our drive after picking him up on Saturday. The guys at Red Lion were very helpful and thank you again for all your help. We will send you some photos when we get out and about. Best regards, Jeff." Unitching & hitching your Go-Pod to your vehicle is super quick. So you can up & go at a moments notice! And once you arrive, there are only two legs to winds down, (most caravans have four), so you'll be relaxing even sooner. We even supply the winder! For quick overnight stays & early starts, leave your Go-Pod hitched to your car for even more convenience!